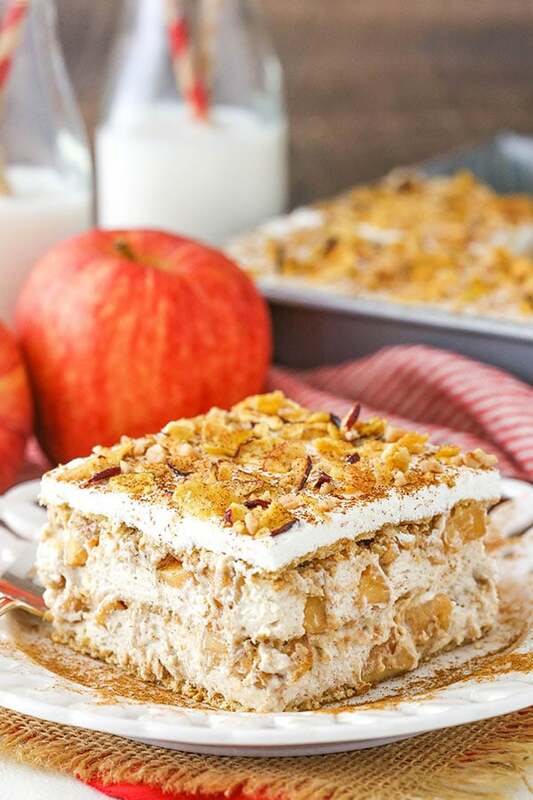 This Cinnamon Apple Icebox Cake is full of apples, cinnamon and a light mousse sandwiched between graham crackers! 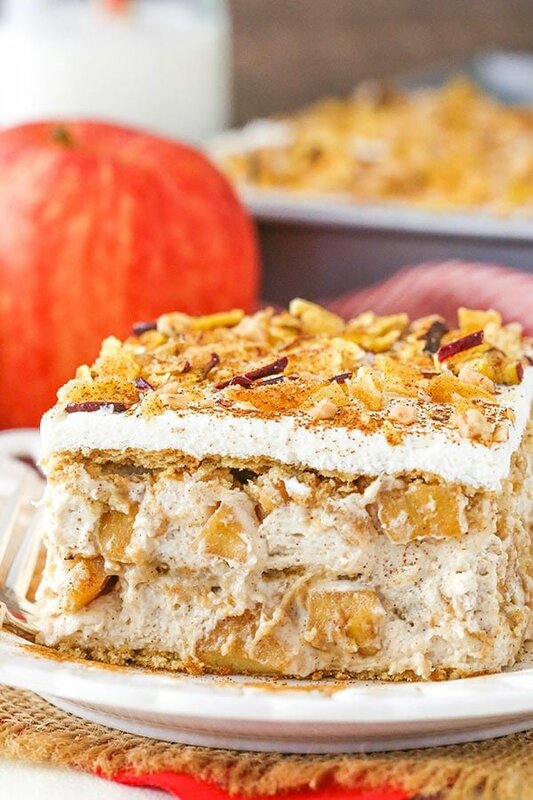 It’s a light, delicious, no bake dessert that’s great for fall! So this Friday, I’ll have my next ultrasound. I’ll be 18 weeks, though just a couple days shy of 19. I’m always a touch anxious for the appointments. I am always excited to see the babies, but I also tend to have a touch of apprehension leading up to the appointment. The moment when they start the ultrasound, before they confirm there’s still heartbeats and everything is ok is a little funky. I can’t help but worry a little every time. We’re also kind of in that timeframe where they say I might start to feel them. Sometimes I think I can feel something strange happening in there, but then I convince myself I’m imagining it. I’m excited for the moment when I finally know for sure that it’s them I felt. The hubs is already grabbing my belly regularly in hopes of feeling something too. 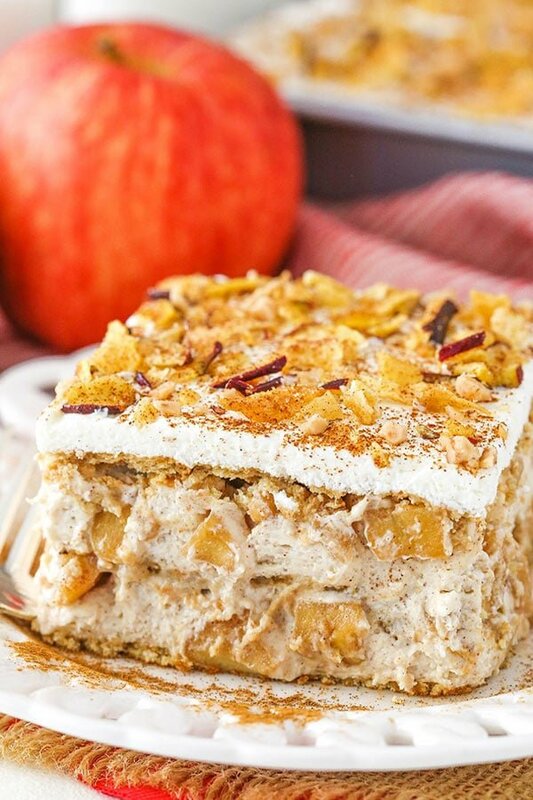 We’ll have to contain our excitement for Friday with this tasty Cinnamon Apple Icebox Cake! I love how easy of a dessert it is to make. Plus, it’s easy to share, making it great for all the gatherings that will be coming up for the holidays. We are getting into my favorite time of year! The icebox cake begins with making the cinnamon apples. They are simple to make and cooked right on the stove. A little brown sugar, cinnamon, nutmeg and lemon juice is all you need. Just toss it all together and cook until the apples are soft to your liking. I often use Red Delicious apples, but feel free to use whichever apple is your favorite. 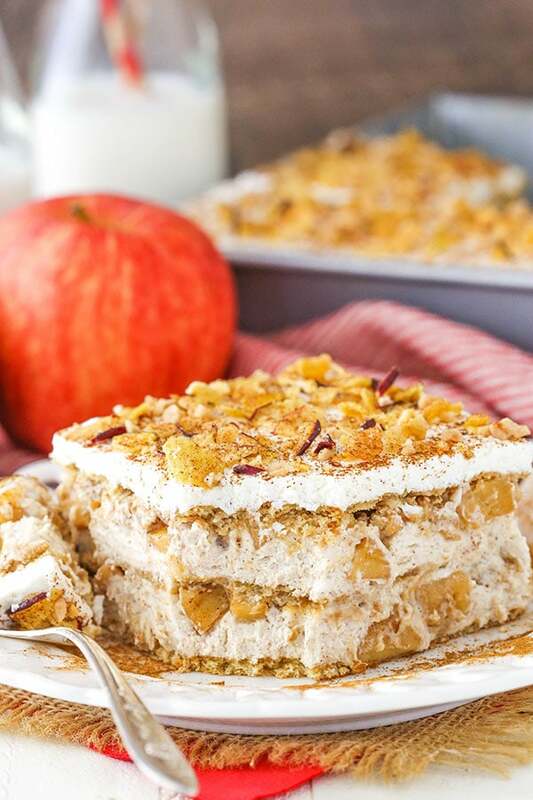 The apples are layered with a cream cheese mousse that’s light and full of brown sugar and cinnamon. Between the apple and mousse layers are the graham crackers. You want to make sure to create a solid layer with them, so you can break larger pieces into smaller ones if needed. If you prefer something other than graham crackers, feel free to use some cookies, such as Walkers Shortbread. I often use those in icebox cakes and love them! Once everything is layered together, refrigerate the cake until it’s firmed up and everything has had a chance to come together and soften. The final cake is pure apple heaven! The light crunch of the cinnamon apples with the brown sugar cinnamon filling is simply delicious! I hope you enjoy it as much as we did! 1. To make the cinnamon apples, add the chopped apples, brown sugar, cinnamon, nutmeg and lemon juice to a pan. Stir together until apples are well coated. 2. Cook apples on medium heat until at desired tenderness, about 10 minutes. Set aside to cool to about room temperature. 3. To make the filling, beat the cream cheese, brown sugar and cinnamon together in a large mixer bowl until smooth. 4. Add the milk and beat until smooth. Set cream cheese mixture aside and make the whipped cream. 5. Add heavy whipping cream, vanilla and powdered sugar to a large mixer bowl and whip on high speed until stiff peaks form. Set aside 1 1/2 cups of whipped cream. 6. Carefully fold the remaining whipped cream into the cream cheese mixture into two parts, folding until well combined. 7. To layer the dessert, use a 9 inch square pan. Add a full layer of graham crackers to the bottom of the pan, breaking some into smaller pieces to fill in gaps as needed. 8. Add about half of the filling on top of the graham crackers and spread into an even layer. 9. Add about half of the cooled apples on top of the filling in an even layer and gently press into the filling. 10. Repeat with another layer of graham crackers, then filling, then remaining apples. 11. Add one additional layer of graham crackers on top. 12. Spread the remaining whipped cream that was set aside earlier onto the top of the graham crackers. 13. Refrigerate until firm, 4-5 hours. 14. 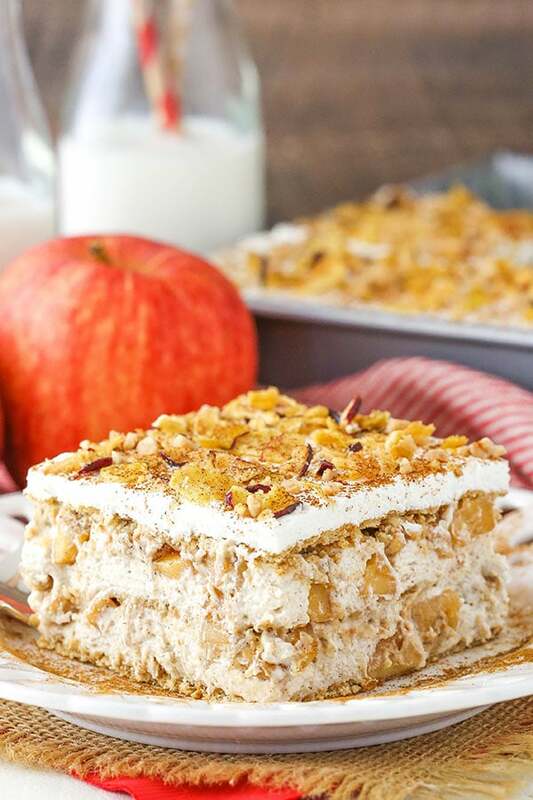 Top the icebox cake with crushed graham crackers or crushed apple chips, then cut into pieces and serve. I’ve never made a icebox cake, never heard of them in the UK does it need to stay refrigerated untill serving? Yes, you’ll want to keep it refrigerated. EEEEK! Ahhhh, Lindsay, I’m dying over your baby updates! I’m so excited for you to feel the little things moving around. I’m glad your little circles have been doing well. And this looks like an excellent spin on the ever popular eclair cake (vanilla pudding/chocolate frosting) my family has at birthday parties sometimes. I’ll bet they’d love this one even more. Love your blog and wish I never have to choose ONE cake to bake at a time????. This looks yum!. Yum! 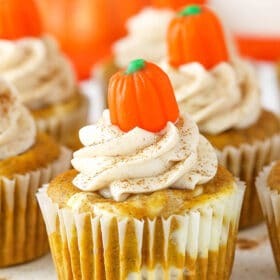 This is an excellent dessert for the Fall. Cinnamon and apple are the perfect combo. Love this cake so much. 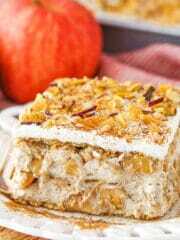 Will follow your recipe and make it soon. 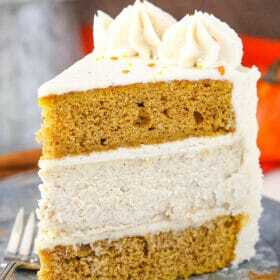 Looks like a perfect fall cake. One question though-can it be made a day or two ahead? I’d made ahead, do you think the graham crackers will become too soft? Really love to make it, but need the time to do ahead. Always a delight to hear the updates on your twins. I made this recipe twice this past fall, and both times it was delicious! One time I made it about 9 hours before serving and the other time the night before. I found when I made it true day of, the bottom layer of graham crackers was not quite as soft as I would like, so I’d recommend making it the night before! A fool-proof, delicious fall dessert.